My first experience on a big event! 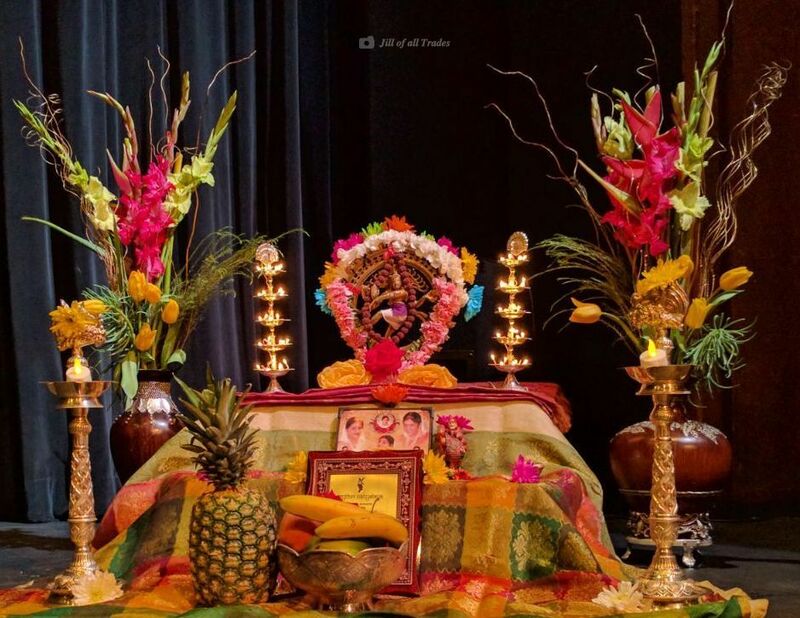 A simple yet an appealing and inviting Arangetram set up for my long-time good friend Sridevi Jeyaraman. 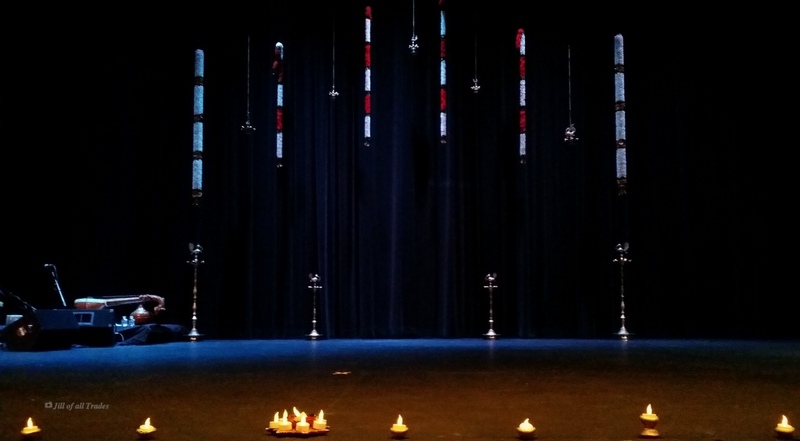 Arangetram event is a milestone for the dancer and I am excited to be part of it with the decorations. 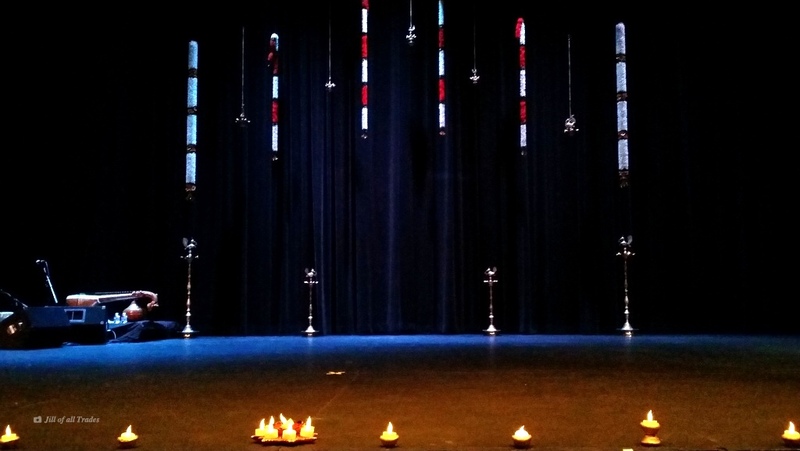 Arangetram is a debut on-stage performance of a student of classical dance and music. 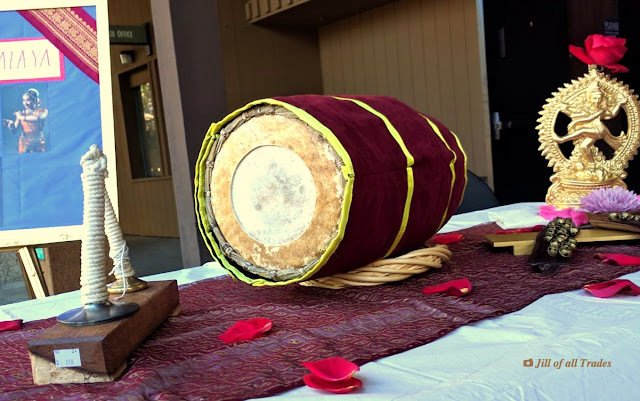 The word Arangetram comes from 2 tamil words Arangam and Erru meaning "to ascend the stage". It is the first performance that follows years of training. Bharathanatiyam is a major genre of Indian classical solo dance originated in the Hindu temples of Tamil Nadu. It is a compound of two words, Bharata and Natyam. The term Bharata consists of Bha-ra-ta. Bha or Bhava (feelings, emotions), Ra or Raga (melody, framework for musical notes) and Ta or Tala (rhythm). The term Natyam in sanskrit means "dance". Sridevi Jeyaraman is an extraordinary dancer, I have known her for more than a decade. She manages to look like a high schooler nevertheless a mother of a middle schooler. She is very enthusiastic about dance and I always admired her perfect posture and the graceful movements. Her solo-dance debut was awesome, her hard work is definitely paid off. Its her passion for dance that took her to this level of accomplishment. Her performance is an absolute treat to the eye. So proud of you my friend! Usually religious themes and spiritual ideas are being depicted in the dance. 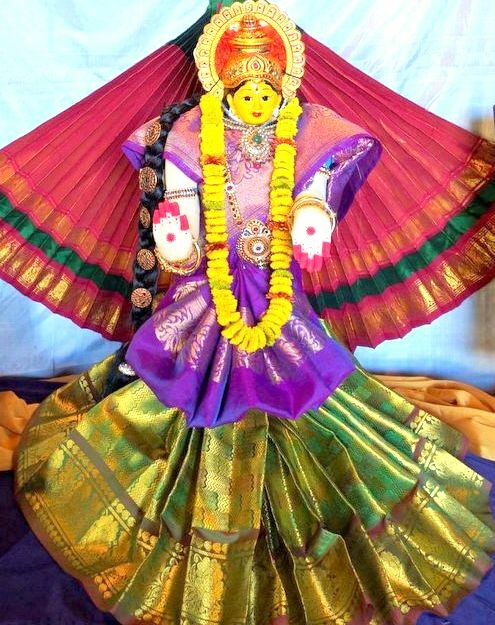 This being the month of Navarathiri and Diwali, the theme chosen by her Guru, Smt. Shirni Kanth was "Devi" (Goddess Durga, Parvathi, Sita, Yeshodha and Radha). A simple, elegant and most importantly a divine setting is what I aimed, for some aesthetic and positive atmosphere. 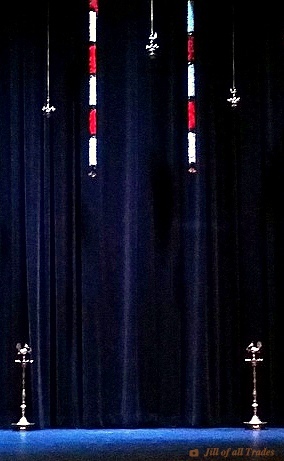 A pleasant stage set up creates a suitable frame for the performance and enhances the overall presentation of the event. Garlands and brass hanging Annam(bird) lamps (velakku) alternatively creates an illusion of depth with its length on the dark backdrop. Standing brass lamps on the floor gives added sparkles of light. The podium is well lighted with LED party lights (Non-Blinking-yellow). A single line of gold spray painted clay lamps(diyas) creates elegance in the front and acts as a sign for the dancer to stay away from the edge during the performance. A group of diya in the center anchored the performer to manage to stay in the center. Hot glued two diyas (inverting the bottom diya) to create a subtle pattern with height. Idols and large lamps in the center was intentionally avoided as it can cause distractions which limits the focus on the dancer. It is a custom in Indian fine arts to set an alter that creates a divine atmosphere during performance. 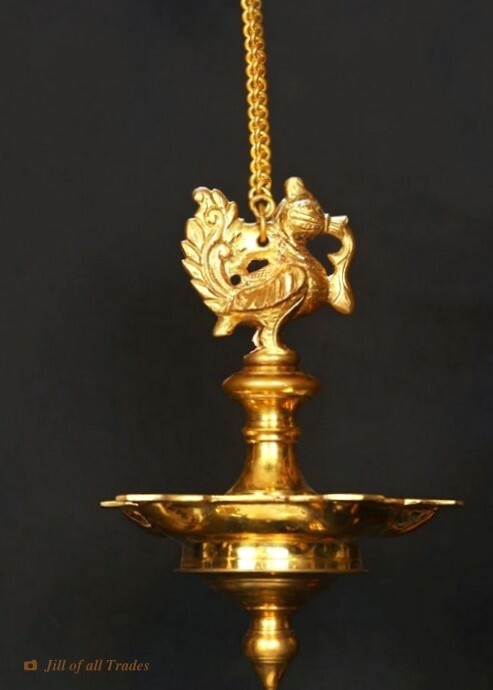 The alter is well lighted with a spot light focusing on the brass Nadaraja idol wrapped in traditional dothi. This is where I got a chance to use wooden decorative vases with metal ornamentation for a set of floral arrangements. Upright Heliconia also known as "Lobster Claw" is one of the largest and heavy flower. The deep red color complements the pink and green Gladiolus. Yellow Tulips and golden twigs gives the right amount of brightness to the arrangement. Pink breath of heaven and Rhipsalis or Mistletoe cactus from my backyard gives a punch of greenery to this arrangement. 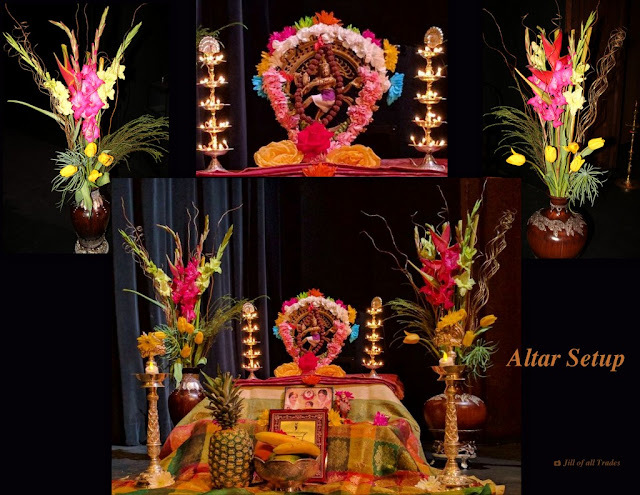 The focal point here is gorgeously decorated Goddess Varalakshmi which creates the right impact and ambience for the performance. Goddess Annapoorani is also decorated and added to this display. On the other side is the guru's picture framed. An attractive jewelry set up with a display of all the ornaments a bharathanatiyam dancer adores. Draped a gorgeous navy blue saree to anchor all the display items. Texture and depth always creates interesting view, for which I played with my large decorative frames. The walls were covered with silk dhothis to set as a backdrop and the dancers fan like part of the traditional attire was used to have a themed decorative display. What is a traditional ambience without our obstacle remover, Lord Ganesha? Decorative lamps and Floral arrangements in brass vases completes this setting. Aromatic eucalyptus leaves, bird of paradise leaves and chrysanthemums along with upright heliconia finishes this set up. 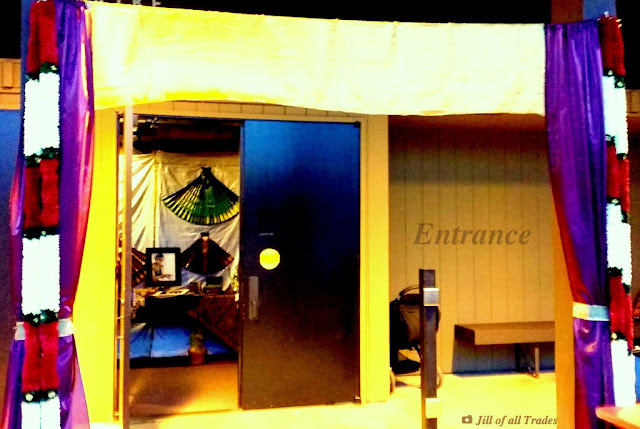 A welcoming entrance sets the first impression in any gathering and it definitely got to be the best. Rich burgundy and purple shades of curtains with golden tissue fabric connects the two curtains. Flower garlands added on both sides creates perfect way of entry. A colorful rangoli with an urali and lamp filled with floating fresh flowers in the center and decorated clay lamps around adds beauty to make it inviting. Two tables on either side uniformly decorated with tablecloth, runner and rose petals. On the left is a small Nadaraja and display of musical instruments like Mridangam, Nattuvangam and the traditional Salangai a dancer gets to wear. On the other, is the welcoming silver plate with aromatic sandal (mixed with rose water and javathu) and kumkum bowls. The agenda, a tray of chocolates, a tulip mini vase, covered with cloth and tied with satin ribbon finishes the table setting. 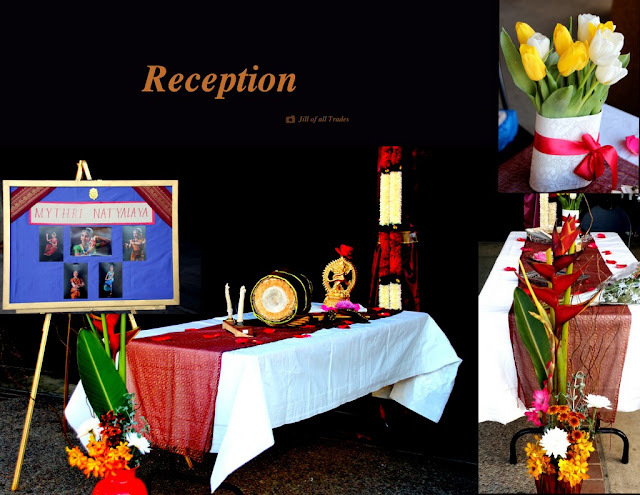 Two floral arrangement in front of the tables and 2 large canvases of the dancer's portrait (not included in the pictures) and the Dance schools board made the reception welcoming and complete. Thanks a lot Kiru ! This was my 1st and i'm glad i got this great opportunity. Looking forward to decorate for your daughters performance too :) Well, Sridevi's husband and some of her friends have sent in their feedbacks which i have attached in the post itself. people about this topic, however, you sound like you know what you're talking about! Stay up the great work! You recognize, lots of individuals are searching around for this info, you can aid them greatly. Hi! Please click on "SUBSCRIBE" located on the top right corner. Thanks for your support! with unique thoughts on this subject matter. Really.. thanks for starting this up. sure I will be told lots of new stuff proper here! this article is awesome, great written and include almost all vital infos. and coverage! Keep up the excellent works guys I've included you guys to my personal blogroll. yet I never found any interesting article like yours. It's lovely worth sufficient for me. which has been discussed for decades. Wonderful stuff, just excellent!